Download all rhymes in a single .zip file. What's the matter with Dickory Dean? ​Who's in the circle today? Reciting rhymes and singing songs are great ways to help a child's development. 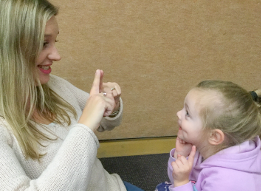 When parents and carers learn a cluster of rhymes and songs they repeat during daily routines, babies often begin to communicate with sounds, smiles and actions. They'll move their bodies to the rhythm of a rhyme or song even before they have learnt to say their first words. Reciting rhymes and singing songs is a wonderful way for parents and carers and little children to have fun together, building the loving attachment between them that is so valuable. The most important voices any baby or toddler can hear are the voices of their parents and other loving adults who care for them. And when it comes to singing songs, it certainly doesn’t matter whether one has a ‘good’ singing voice or not. Face-to-face is best. Babies and toddlers watch faces. They learn they are loved from the smiling facial expressions of their parents and carers. In a Parent-Child Mother Goose group, toddlers may prefer to sit facing other children, and this is developmentally appropriate. However, when one-on-one, face-to-face is always best. Recite rhymes and sing songs slowly. This helps little children hear the words and notice actions. Recite or sing a few favourite rhymes and songs throughout daily routines (while feeding, changing nappies, bath time, soothing). This helps babies and little children learn to anticipate routines. Hold and support babies and toddlers appropriately for their stage of development. Babies need to be held close and very well-supported with gentle actions like cuddling, rocking and swaying. Once a baby has developed head and trunk control, you can introduce gentle bouncing. Be sensitive to children’s preferences to touch. Some don’t like tickling while others love it. Some prefer not to have their torsos touched, but may love to have their arms or legs massaged. At home, encourage babies and toddlers to participate by pausing after the end of a line or phrase once a song or rhyme is familiar. Pausing gives a baby or toddler the chance to make a sound or fill in a word. Wait for child to join in with 'out', or with some approximation of that word. Substitute the child’s name and family members’ names in rhymes and songs. Children love to hear names they are familiar with. ​Gently touch baby’s hair to cue her that you are going to touch her face. As you recite line one, run your finger gently around her face. Then point to her facial features as you name them. You can also use this rhyme as a baby massage by using two fingers of each hand while your baby is lying in your lap or on a rug on the floor. Clap hands on thighs and hands. Go around the circle, introducing each child by name. ​Substitute your child’s name for ‘Uncle John’ and other family members’ names. ​A smooth road: use swaying action. A windy road: use circular action. A rough road: use a gentle bounce. A bumpy road: use bigger bounce, then PAUSE so your child will learn to anticipate the hole. A … hole: drop toddler between knees; bring baby to your chest for a cuddle. ​Use washing machine ‘agitator’ action while child is sitting in your lap. Watch: faster bounce, tickle or little kisses. For the Lollies in a jar verse: use a very gentle, well-supported bouncing action with babies held closely to you. Always be very gentle with babies, and never shake them. Sit on floor with your knees bent up. Toddlers sit atop your knees while you hold their hands and make a bouncy action. Slide them down your knees to the floor for ‘whoo!’. Bounce to the left for Wibbleton, to the right for Wobbleton. Holding baby’s foot, tap on ball of foot then heel, then make long gentle strokes on sole of foot while saying ‘let the little brumbies go bare’. Substitute worms for snakes if you wish. Use finger to run lines down child’s back. Trace long line, then short line. Fat: trace using two fingers spread apart. Skinny: trace using one finger. Straight: trace one straight line. Bite: walk two fingers up back to neck and give a gentle pinch. Tickle: give gentle tickle on back of neck or kiss. ​First verse: you may like to play peek-a-boo. Second verse: point to baby’s fingers, toes and belly button. Gently lift legs in criss-cross fashion, then up at ‘whoops’. Hold baby’s legs up and circle then for first three lines, then kick them. Circle again for rhumba, then gently spilt them (but don’t split if baby has any hip concerns). Substitute child’s name and family members’ names for subsequent verses. Point to fingers one at a time, starting with baby’s little finger, then say ‘whoops’ while you run your finger dipping between index and thumb. Then go backwards from index finger to little finger again, saying child’s name again as you touch each finger. Walk your fingers up the child’s body, then down again. Give a very gentle tap on the foot when you say ‘take that you flea’, or clap your hands. For toddler: act out actions with hands. hole: trace finger around belly button. Run finger in a circle over baby’s palm. One step, two step: step fingers up arm to armpit and give gentle tickle. Verse two, haystack: trace finger around belly button. One step, two step: step fingers to arm pit and give gentle tickle. Use three fingers in swinging action. For verse two, use two fingers. For verse three, use one finger. For Mr Crocodile: quietly open and close hand. For snap: clap hands together. When third monkey says ‘You missed me’, raise a finger high above baby to indicate the monkey swinging clear of Mr Crocodile, then finish with a kiss. Make appropriate gestures with your hands if sitting down, or with whole body if standing up. Fast, fast, fast: roll hands quickly and say this line fast too. Slow, slow, slow: roll hands very slowly and slow down voice. Kingdom: trace big circle or hold out hands wide. Town: trace smaller circle or bring hands further together. Hill: make hill shape with hand. Street: move two hands away from body in a forward action. Room: make a square with hands. Bed: bring hands to side of face and lean head on them. Baby: make rocking action with hands, pause and say 'shhh'. Peel: hold up a finger and make peeling action with thumb and index of other hand. Chop: make chopping action with blade of hand on palm. Mash: make mashing action with palms together. Eat: bring hands to mouth, then PAUSE, ….and bend down. Go bananas: shake hands bringing then up and act out going ‘crazy’. Puff, puff, puff: After saying 'puff' the third time, gently blow on baby’s face or arm. Rough: After saying 'rough', blow more strongly on baby’s face or arm.